It is with sadness and a strong sense of personal loss that I record the death of my dear friend Hymie Berkowitz. He died on 20 July 2008 at the age of 86 in Sydney, Australia. He was born in Kimberley and at an early age moved to Johannesburg. 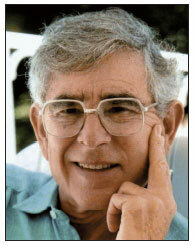 He went to King Edward High School and Wits University, where he graduated MB BCh in 1944. He subsequently joined a GP practice in Durban in 1947, gaining his higher qualification (MFGP (SA)) as a family physician in 1974. In 1982 he joined the Academy of Family Practice and was very involved as secretary of the Durban branch and a strong supporter of the Balint Group. In 1983 he was elected as an honorary life member of the Jewish Old Age Home Beth Shalom for his unstinting service to its inhabitants and later honoured by the day surgery being named after him. In 1987 he was granted life membership of the Medical Association. Hymie was one of the dying breed of general practitioners who were truly family doctors, available for their patients 24 hours a day. He was always calm and collected, no matter how serious the situation. He had a wonderful clinical sense and was an excellent diagnostician. In the 46 years of our friendship I never saw him lose his temper or speak ill of any person or colleague. He was a true gentleman, highly respected and loved by all his patients and friends. He touched their lives with genuine unforgettable and sincere warmth, knowing that he cared about them and would give each of his very best, be they rich or poor. Hymie married Doris Philips, who was the perfect doctor's wife, giving him much support, care, nurturing and love in his arduous profession as a GP. They were blessed with a love affair which lasted during their 54 years of marriage. In 1999 Hymie retired from practice and emigrated to Australia with Doris to be near his family and two of their daughters. A third daughter lives and practises as a paediatrician in New York. Hymie was very happy in his new home, adjusted well to his new country and became very involved with the University of the Third Age. He was a keen gardener and no doubt his small garden in Sydney was as beautiful as his garden in Durban. Rest in peace my dear friend; you will never be forgotten by the many people who loved and respected you.